We’re thrilled to be able to offer our customers (that’s you!) 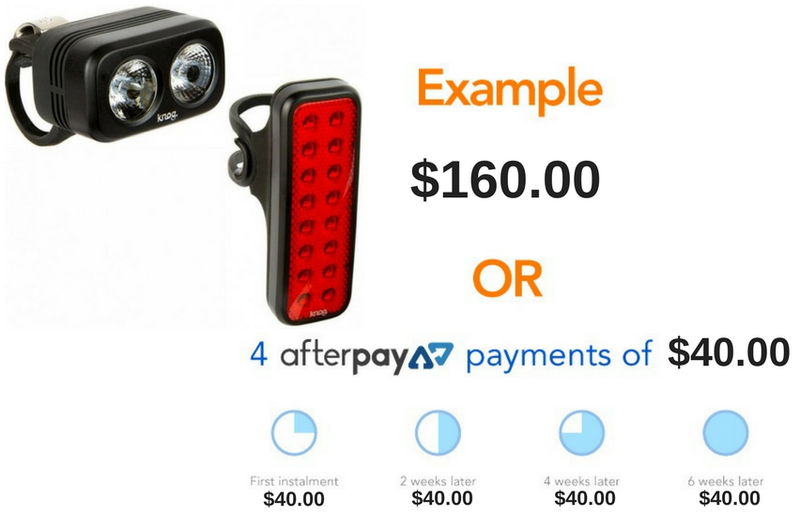 the option of buying your bicycle parts and accessories now and pay later with thanks to our friends at Afterpay. There are so many reasons to buy bicycle parts and accessories online, but sometimes, the weekly budget just doesn’t allow it! Well, that’s where Afterpay comes in. Being able to Afterpay cycling goods is an incredible offer and we’re proud to announce to make this announcement: Mr Cycling World has teamed up with Afterpay to give you a completely guilt-free shopping experience by allowing you buy your bike stuff now, and pay for them later. How fun! Order your cycling equipment now, and pay for them in instalments every fortnight over four equal payments. Your order will be delivered just like any standard purchase. All you do is pay for them later. After. Pay. Geddit? Afterpay is all about convenience. Your Mr Cycling World order gets processed straight away, and you just pay for them fortnightly over 8 weeks. You can use it for orders up to $1000 and there is NO interest, delays or added fees! So easy! Once the criteria above is met, just select Afterpay as the payment method on the checkout page of mrcyclingworld.com.au, and follow the prompts with Afterpay. Simples! The payment arrangement is made with Afterpay Pty Ltd and they will approve payments at the time of order. For first time Afterpay customers, the first payment will be charged at the time of purchase. You will no longer be considered a ‘new’ customer once you have fully paid off your first order 6 weeks later. For any order thereafter, your first payment will only be deducted 2 weeks after your purchase and your last payment deducted 8 weeks after purchase. The full payment schedule will be provided to you at the time of purchase. Please note, when you order with Afterpay you will need 25% of the order total in your account when you make an application. If you do not have the funds in your account, Afterpay will decline this order. If you fail to make one of your fortnightly payments, Afterpay will charge you a late payment fee of $10 and an incremental $7 late fee for each week the order is overdue (subject to change – please refer to Afterpay for latest details). Should you require a refund and you meet the conditions in our refund policy, you’ll be eligible for a refund via Afterpay and we can cancel the payment plan less any admin/restocking fees that may apply. For more information regarding Afterpay and their services, you can visit the Afterpay FAQ page by clicking here.